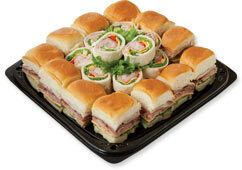 Let us help to make your party planning a snap. 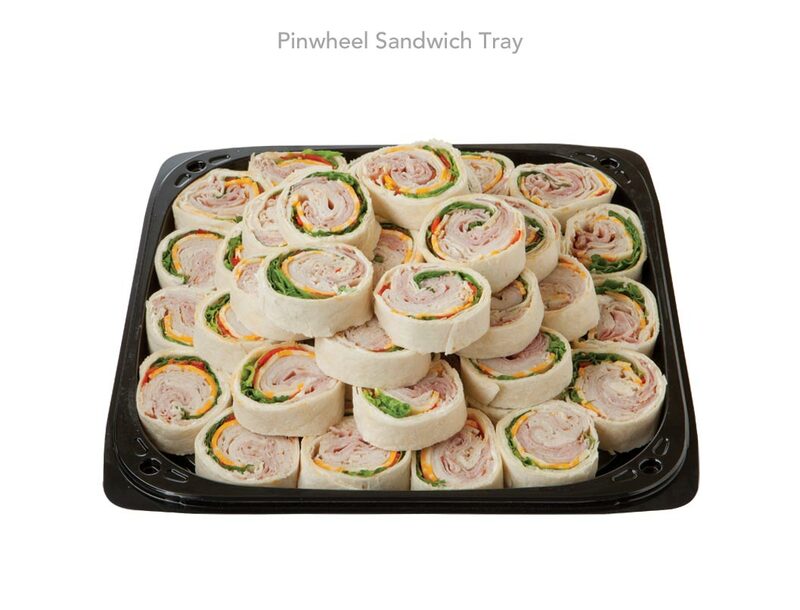 Whether it is an informal gathering or an elegant affair, we have everything you need. 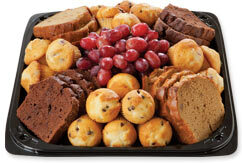 Our delicious deli trays and beautiful bakery cakes will make your party one to remember! 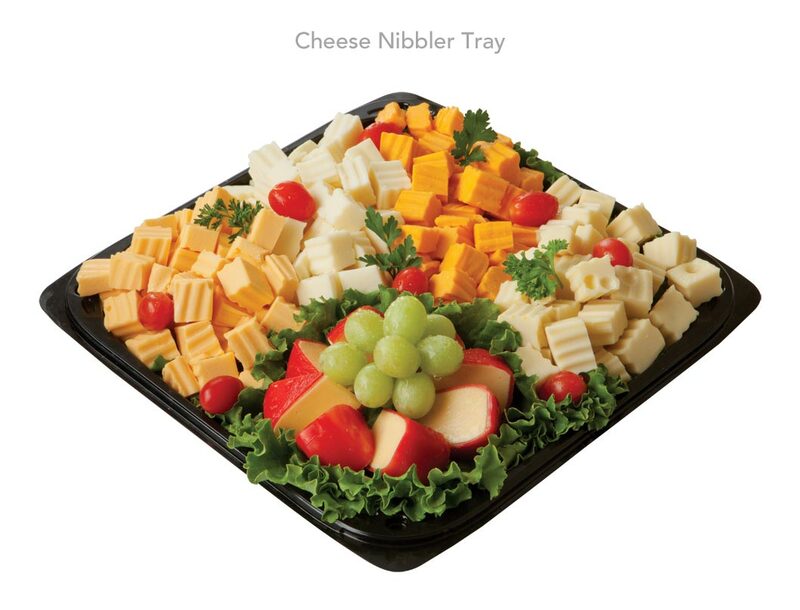 Small Serves 8-10 $39.99 Mounds of decoratively cut chunks of baby Swiss, havarti, mild cheddar and yellow American cheese fan wedges of red wax gouda, accented with a cluster of juicy grapes. 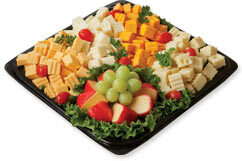 A cheese lover’s delight! 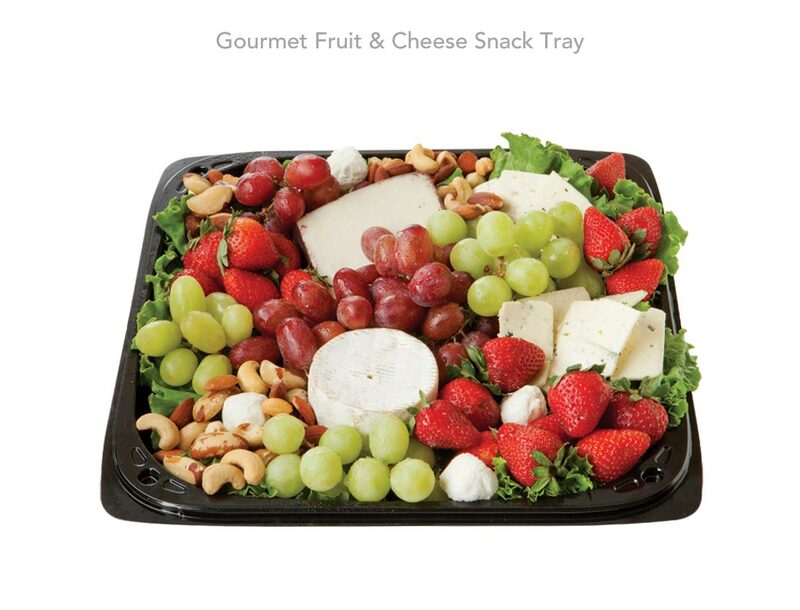 Size Serves 12-15 $49.99 Plump, sweet red and green grapes, juicy strawberries, mixed nuts and assorted cheeses are artfully arranged making this tray as pretty as it is delicious. A creamy round of brie and bite-sized mounds of soft Chevre cheese contrast nicely with the more robust flavors of both bleu and wine-soaked goat cheese. 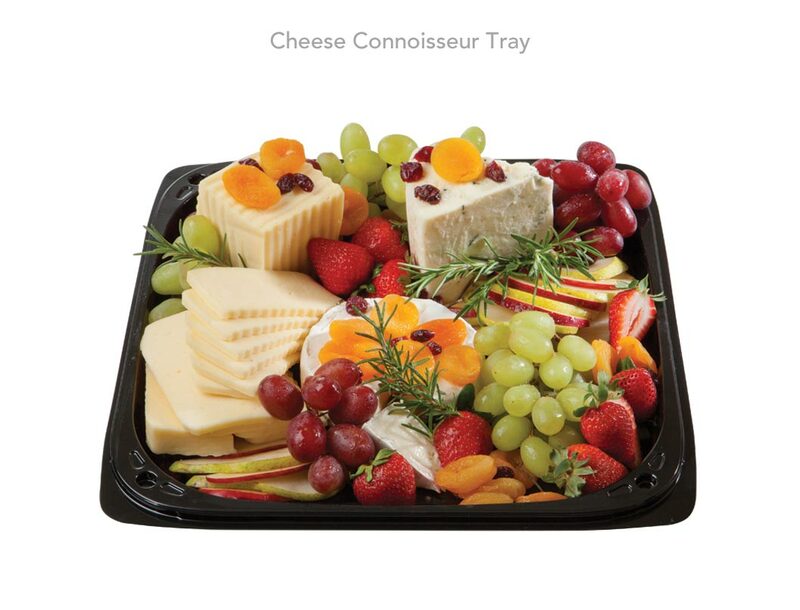 Small Serves 8-10 $29.99 A creamy round of Boursin® Gournay Cheese presides over slices (or cubes) of baby Swiss, colby jack, mild cheddar, pepper jack, provolone and yellow American. 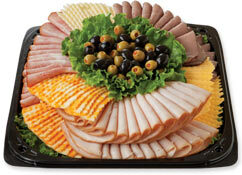 Size Serves 12-15 $49.99 With its varied shapes, textures and colors, this gourmet assort- ment is a work of art. 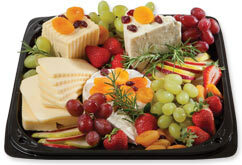 Bleu, brie and havarti cheese share the canvas with fresh grapes, plump strawberries and slices of crisp apples and pears. Fresh rosemary, dried apricots and cranberries provide the “pièce de résistance”. 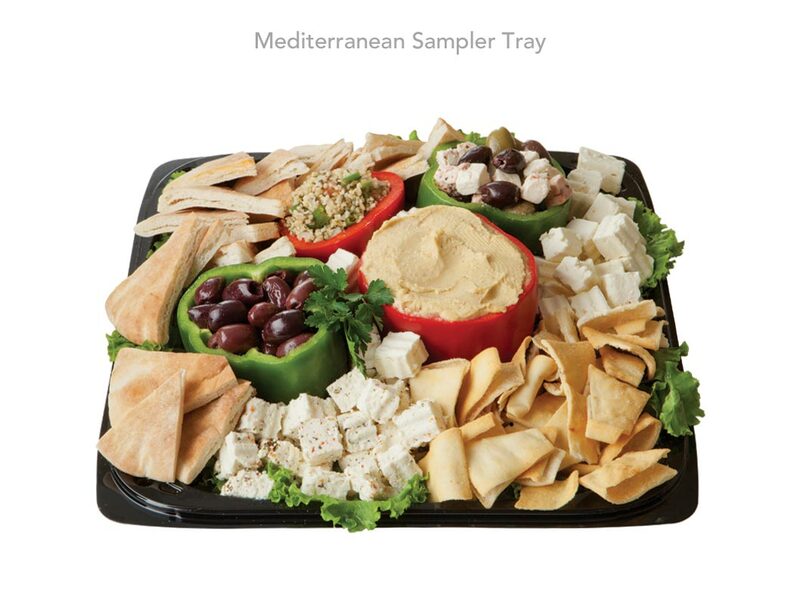 Size Serves 12-15 $39.99 Bell pepper bowls feature fresh Tabouli salad (we make it ourselves! 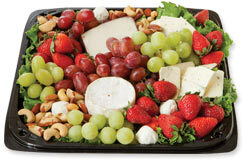 ), Greek feta salad, classic hummus and delectable pitted Kalamata olives. 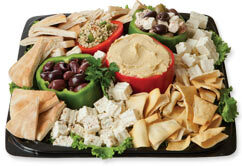 Scattered throughout are chunks of plain and tomato basil feta and crispy pita wedges and chips. Opa! 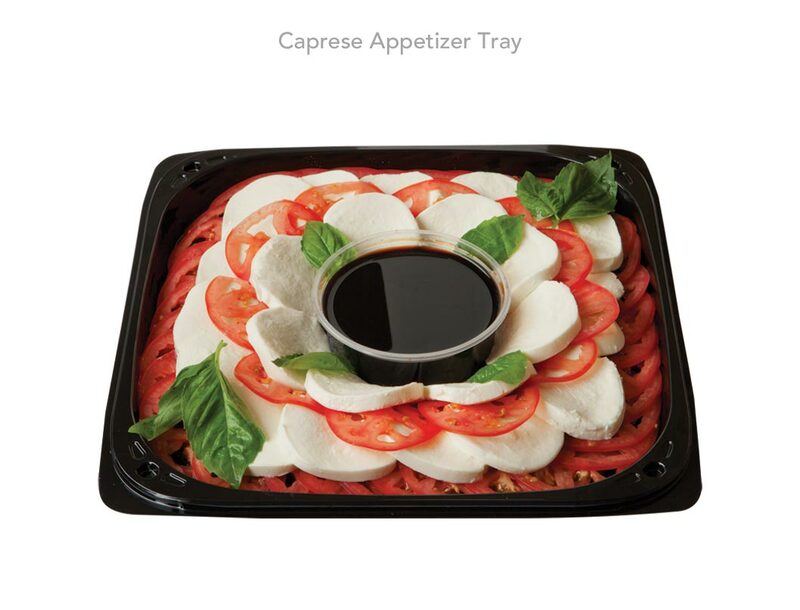 Size Serves 12-15 $39.99 Slices of red tomato and creamy fresh mozzarella artistically encircle a container of tangy balsamic vinegar. 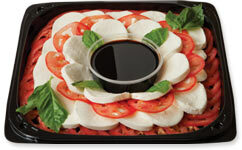 Fresh and fragrant leaves of basil add the finishing touch to this popular salad. 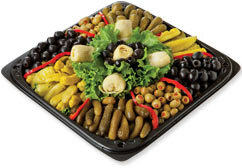 Medium Serves 12-15 $59.99 Heaps of baby kosher dill and sweet pickles, Spanish green and pitted black olives, kosher dill pickle spears and mild pepperoncini peppers are sectioned by strips of red pepper and capped off with artichoke hearts and olives on a bed of fresh lettuce. 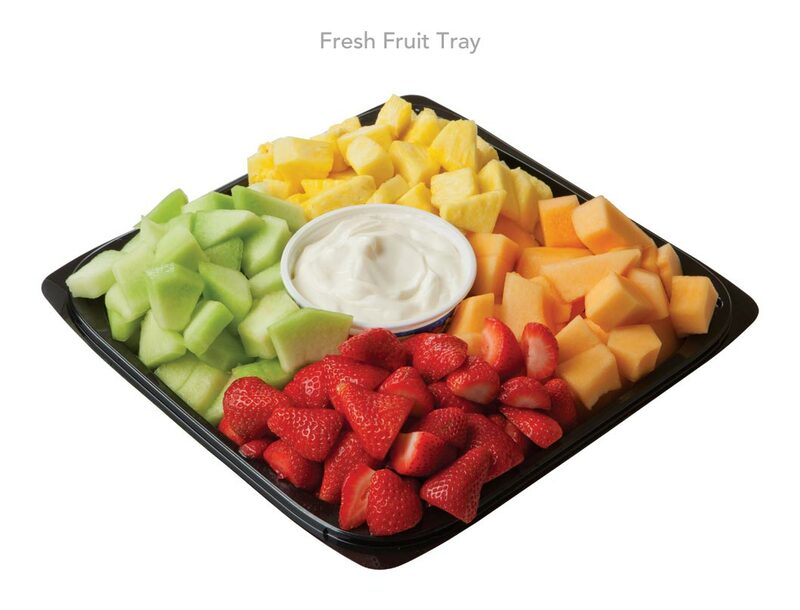 Small Serves 8-10 $19.95 Fresh, colorful and sweet describes this gorgeous fruit tray. 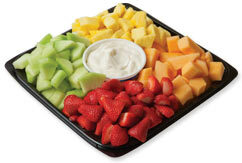 Generous chunks of melon, juicy pineapple, and ruby red strawberry halves surround a 13.5 oz. tub of luscious fruit dip. 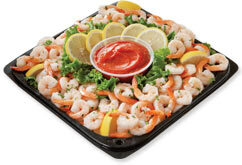 Small Serves 8-10 $17.95 A classic tray that’s always appreciated. 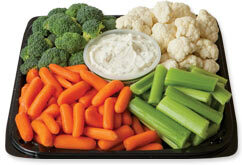 Liberal mounds of crisp and colorful fresh veggies encircle a 14 oz. tub of creamy dip. Let the dunking begin! 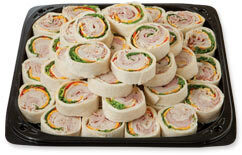 Small Serves 1 dozen $21.99 Rising high, these dollar rolls are stacked to satisfy. 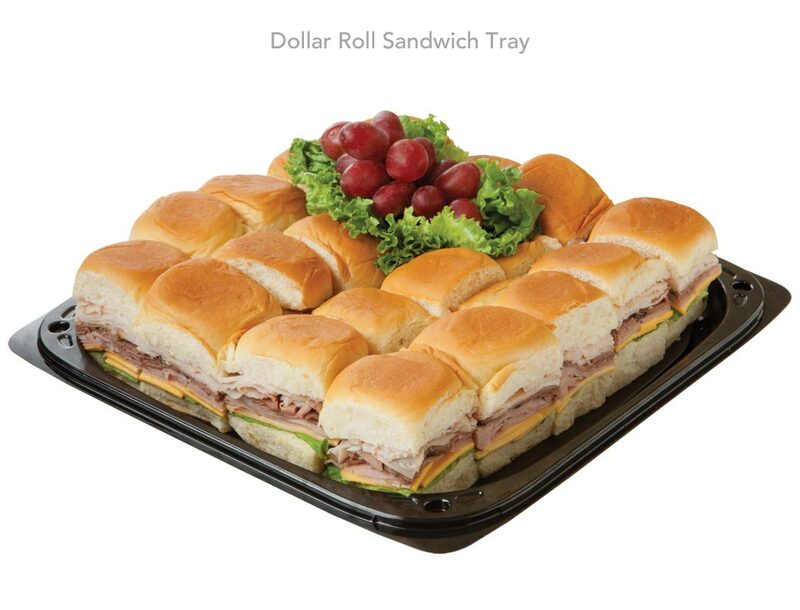 Kings Hawaiian® Rolls are split in half and layered with slices of three different meats: smoked ham, roast beef and smoked turkey. 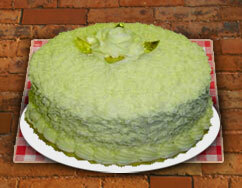 Slices of yel- low American cheese are then added along with fresh, crisp green leaf lettuce. These robust sandwiches are worth far more than their name implies. Medium Serves 12-15 $24.99 These circular bites are always a hit. Cream cheese, colby jack cheese, smoked ham, smoked turkey, green leaf lettuce and red bell pepper strips are tightly spun inside a white tortilla. As fun as they are flavorful. 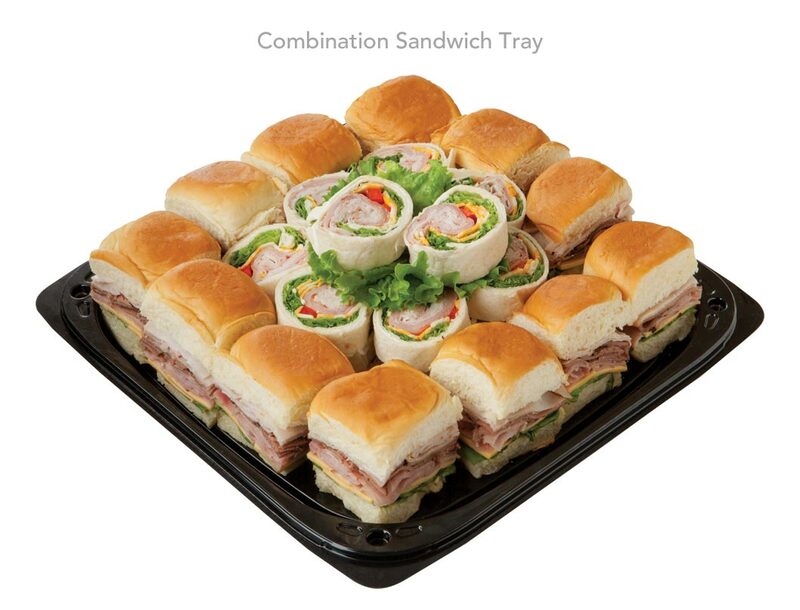 Size Serves 20-25 $39.99 Can’t decide which Sandwich Tray to order? 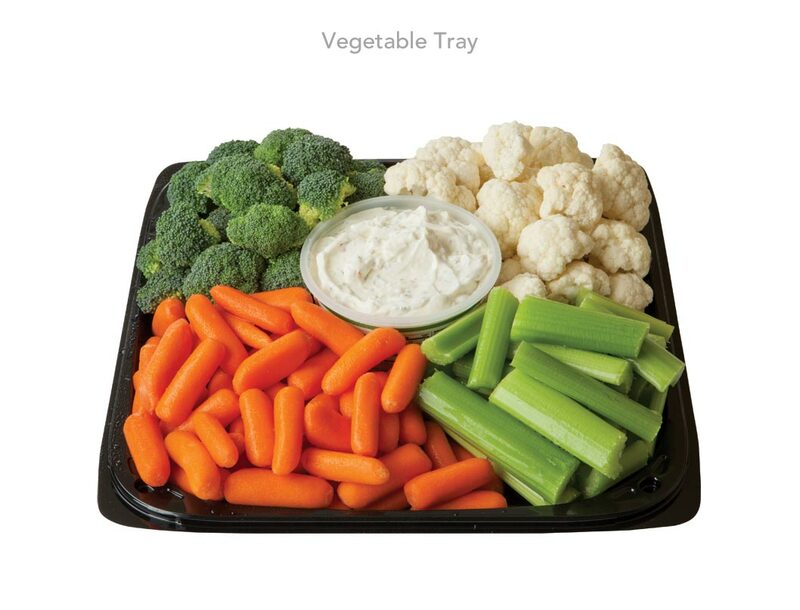 We’ve created a tray just for you. 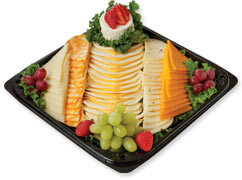 Small Serves 8-10 $44.99 Don’t let the graceful fan of meat and cheese fool you. 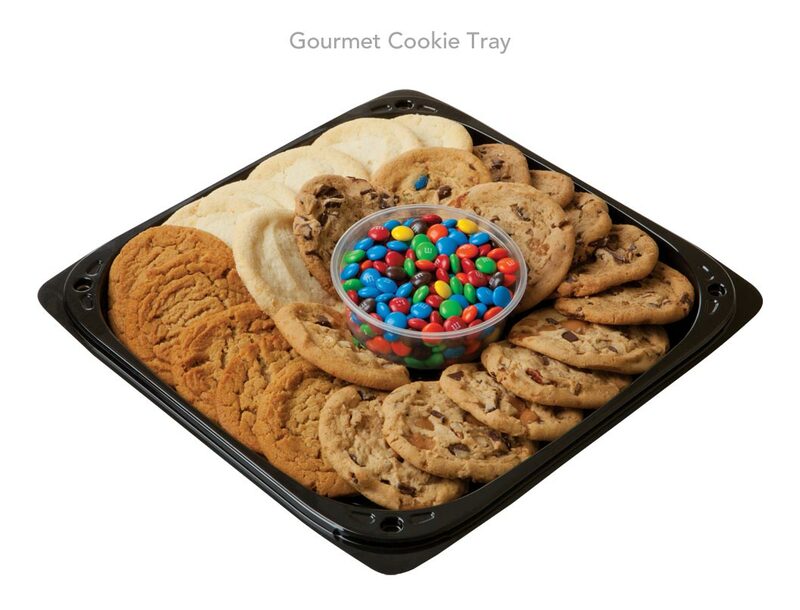 This is one hefty tray! 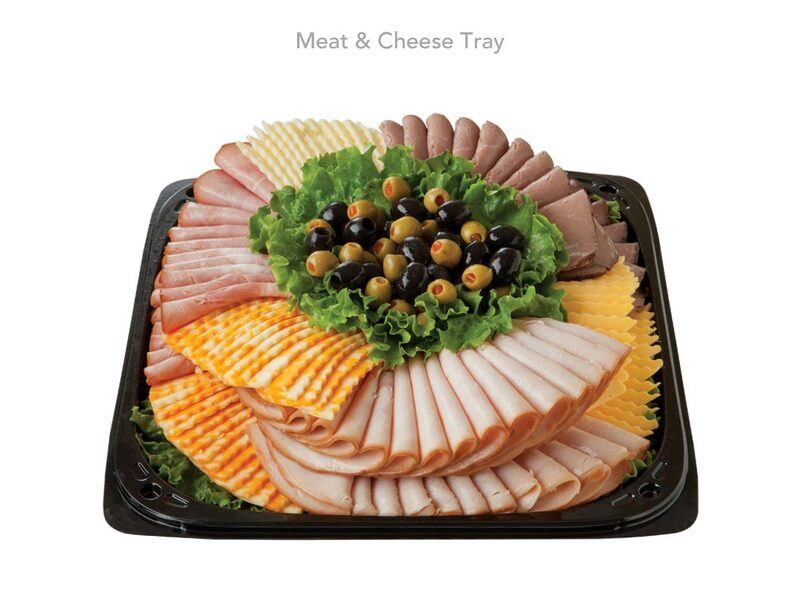 Ruffled edge slices of baby Swiss, colby jack and yellow American cheese alternate between folded slices of honey or smoked ham, roast beef and smoked or oven roasted turkey. 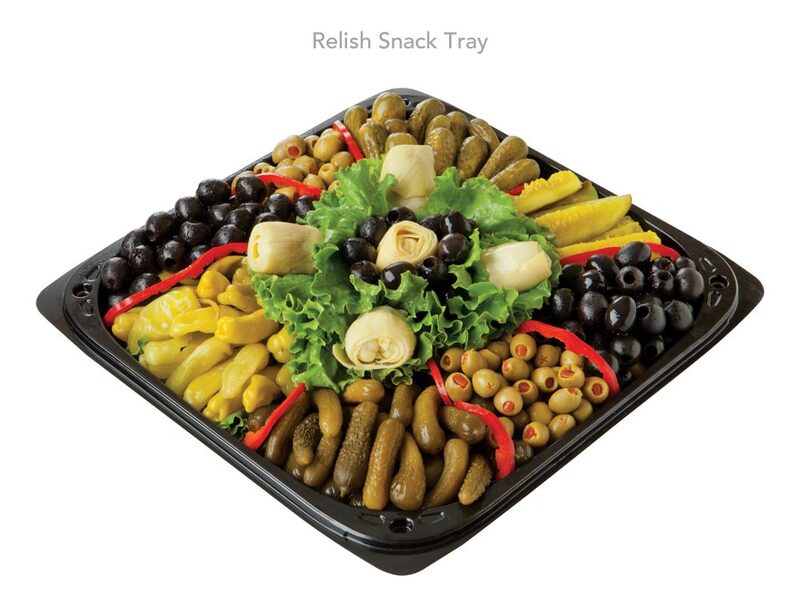 A crown of mixed olives provides a tasty garnish. 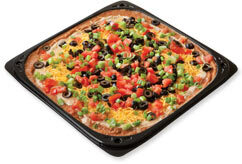 Size Serves 12-15 $39.99 Layers of creamy refried beans and tangy sour cream provide the base upon which shredded cheddar cheese, diced fresh tomatoes and sliced green onions and black olives are sprinkled, liberally. Buy sturdy chips. 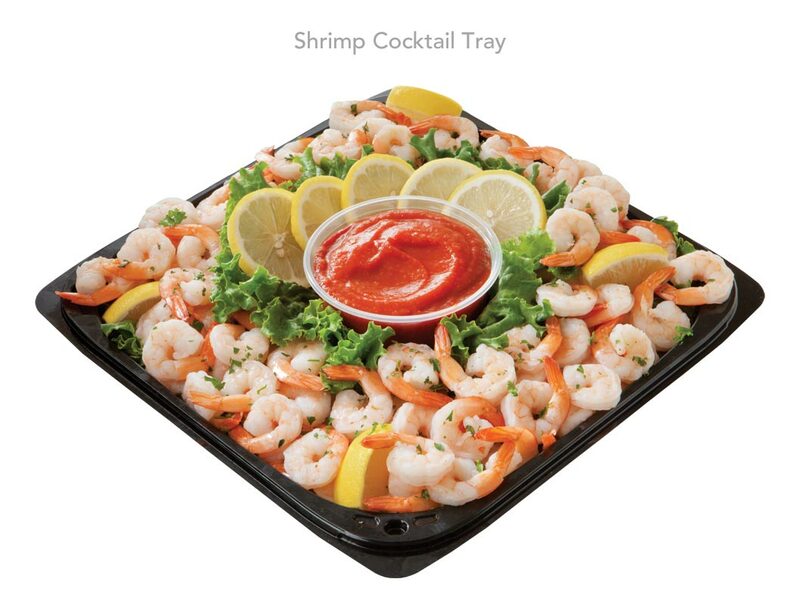 Size Serves 8-10 $44.99 Fresh, peeled shrimp (41-50 count) are mounded high on this tray which features zesty cocktail sauce (you choose hot or mild) and sunny slices of lemon. 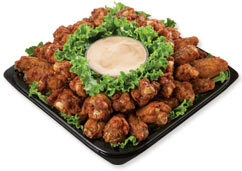 A favorite at any party or celebration! 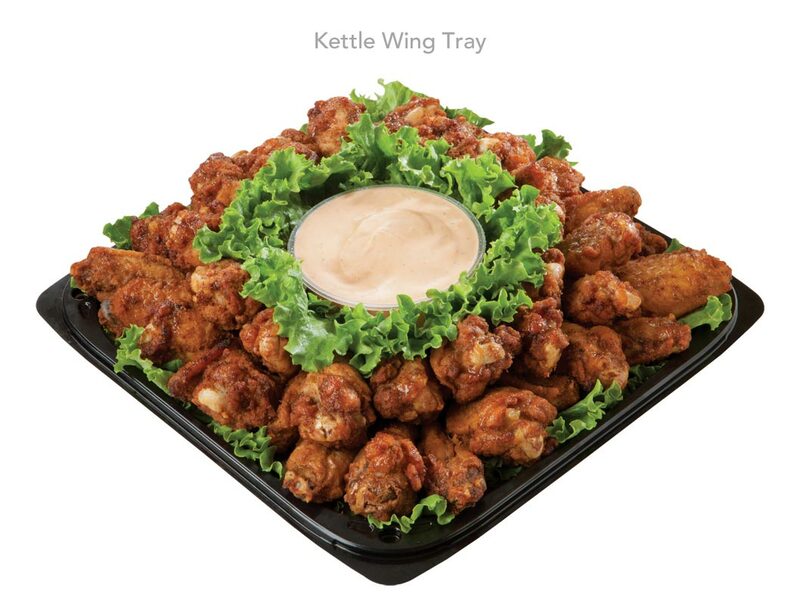 Medium Serves 8-10 $39.99 Fresh chicken wings and drummies are dredged in special seasoned flour and then kettle fried to crispy perfection in store. 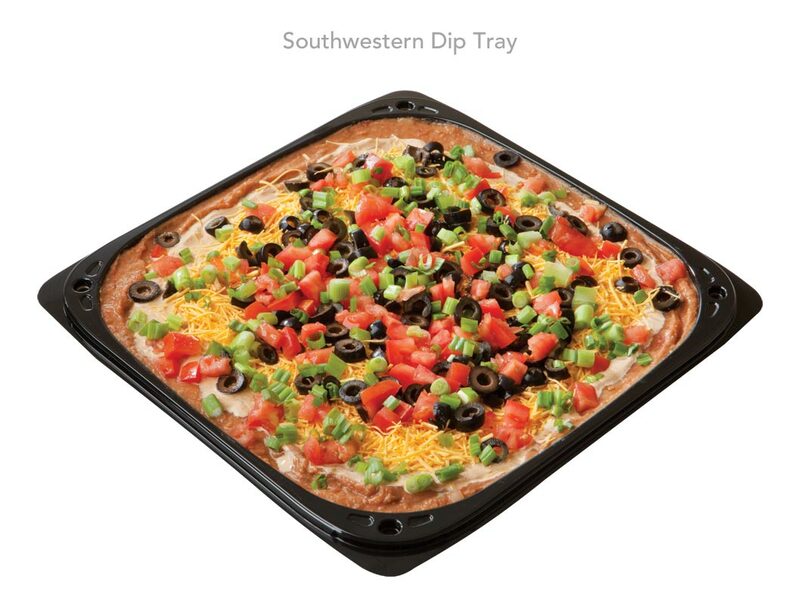 Piled high, they’re ready for dunking in either buffalo ranch or BBQ dip. Medium Serves 24-30 $24.99 Resistance is futile. 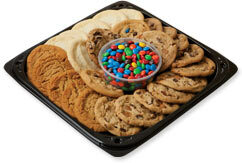 Baked fresh in store, this yummy assortment includes chocolate chunk, candy chip, caramel chocolate pecan, peanut butter and sugar cookies. Everyone is sure to find their favorite. A playful pile of brightly colored M&Ms makes a super-sweet center. 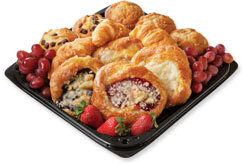 Size Serves 12-15 $24.99 Rev up those early morning meetings with this plentiful platter of YUM! 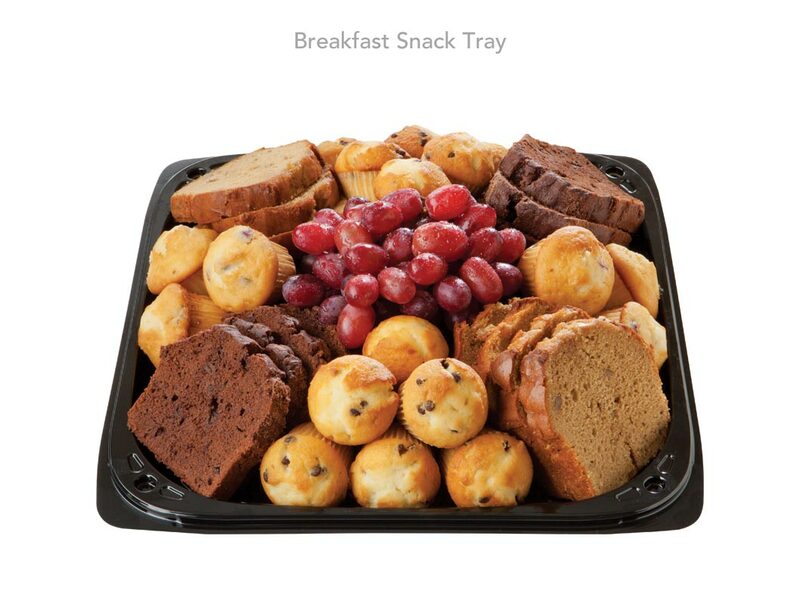 Generous slices of banana nut and chocolate cream cake snuggle alongside mounds of assorted mini muffins, all of which encircle a big cluster of juicy red grapes. 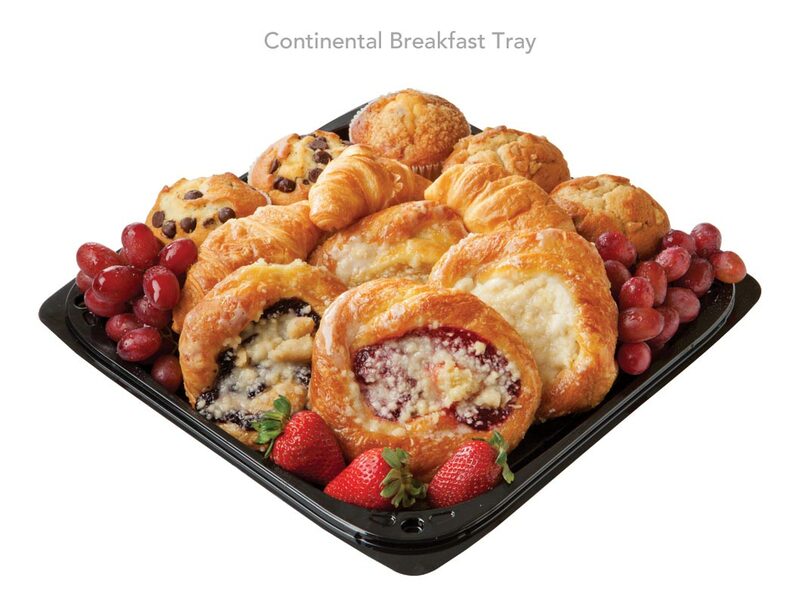 Size Serves 8-10 $29.99 Buttery, mini croissants, assorted moist muffins and fresh baked fruit Danish jostle for space on this tray of breakfast bounty destined to brighten any morning. 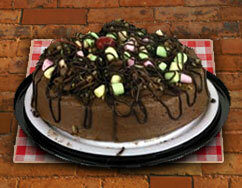 Single Layer Serves 8 $6.99 Your choice of white or chocolate cake filled with Bavarian cream and topped with melted fudge icing! 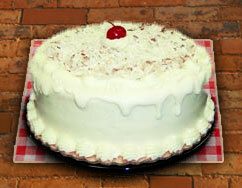 Single Layer Serves 8 $9.99 A moist cake with coconut and pecans baked right in! Rich cream cheese icing makes this delicious cake a favorite! 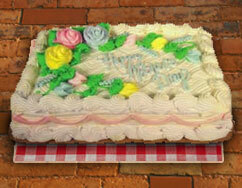 Single layer Serves 8 $6.99 A delicious red devil`s food cake iced with rich cream cheese icing and topped with delicate icing rosebuds! 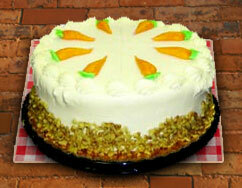 Single Layer Serves 8 $9.99 A moist and delicious cake with carrot, pineapple, walnuts and raisins baked right in, iced in rich cream cheese icing and garnished with chopped pecans! 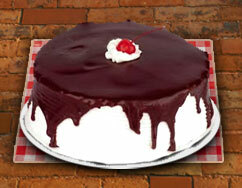 Single Layer Serves 8 $6.99 A chocolate cake iced with chocolate buttercream icing, drizzled with melted fudge icing and topped with delicious cherry filling! 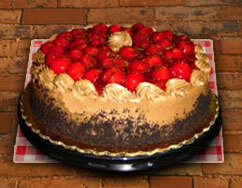 This decadent dessert cake is perfect for any occasion! 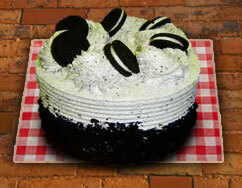 Single Layer Serves 8 $6.99 A chocolate cake iced with cookies and cream whipped icing, melted fudge icing drizzle and topped with Oreo cookies! 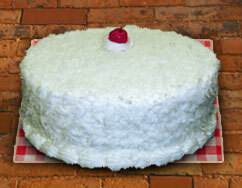 Single Layer Serves 8 $6.99 A moist white cake iced with vanilla buttercream icing and coated with soft flaky coconut! A cherry tops off this classic favorite! Single Layer Serves 8 $6.99 A light chocolate cake iced with chocolate buttercream and melted fudge icing drizzle, topped with a rich coconut and praline icing! Single Layer Serves 8 $6.99 A layer of white and a layer of chocolate cake iced with vanilla buttercream and partially coated with a melted fudge icing! 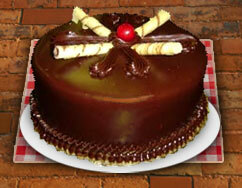 An elegant all occasion dessert cake! Single Layer Serves 8 $6.99 A chocolate cake with chocolate buttercream icing topped with marshmallows, chopped pecans, chocolate chips, toasted coconut and caramel drizzle! Single Layer Serves 8 $6.99 A chocolate cake iced in caramel whipped icing with melted fudge drizzle, topped with Snickers candy bar pieces and strings of melted caramel! Single Layer Serves 8 $6.99 A chocolate cake iced with chocolate buttercream and a thick caramel drizzle, topped with chopped pecans, chocolate chips and melted fudge icing drizzle! 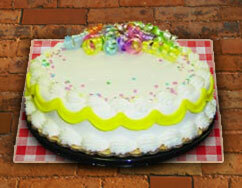 1/4 Sheet Serves 24 $16.99 Your choice of white, chocolate or marble cake iced with vanilla or chocolate buttercream or whipped icing, and custom decorated any way you would like! 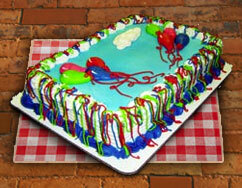 Ask our cake decorators about the newest toy kits and themes! Single Layer Serves 8 $6.99 Your choice of white or chocolate cake iced with your choice of vanilla or chocolate buttercream or whipped icing and decorated any way you would like! 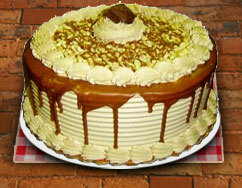 Let our decorators custom decorate your cake creation! Single Layer Serves 8 $7.99 A chocolate cake with raspberry filling lightly iced in chocolate buttercream and finished with an elegant poured fudge icing! 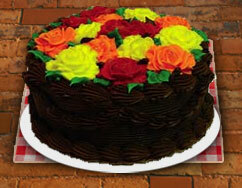 Icing lacework and a single icing rose top this chocolate masterpiece! 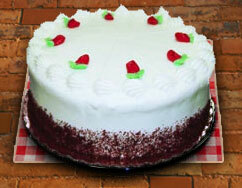 Single Layer Serves 8 $7.99 A white cake with raspberry filling iced with rich cream cheese icing! 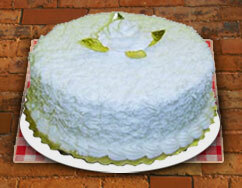 Finished with beautiful icing lacework and topped with a single icing rose, this is an elegant cake for any occasion! Single Layer Serves 8 $7.99 Your choice of white or chocolate cake with raspberrry filling iced in your choice of vanilla or chocolate buttercream and finished with beautiful icing lacework! A culinary work of art! Single Layer Serves 8 $7.99 A chocolate cake lightly iced with chocolate buttercream and finished with an elegant poured fudge icing! 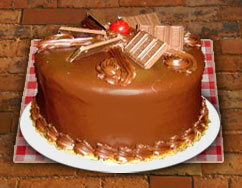 Hershey`s candy bar pieces top this cake to make it a chocolate lover`s dream! Single Layer Serves 8 $7.99 Your choice of white or chocolate cake with vanilla or chocolate buttercream icing, and topped with a mound of beautiful icing roses! 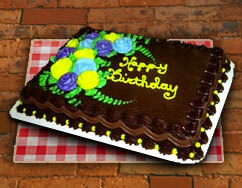 Let our decorators customize your cake to match the colors of your special occasion! Single Layer Serves 8 $7.99 A chocolate cake lightly iced with chocolate buttercream icing and finished with an elegant poured fudge icing! 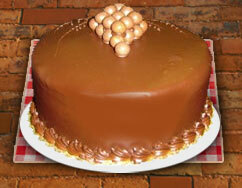 Topped with a cluster of chocolate grapes made from malted milk balls. 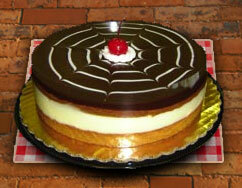 A classy cake for your special occasion! Single Layer Serves 8 $7.99 A chocolate cake lightly iced with chocolate buttercream icing and covered with an elegant poured fudge icing! 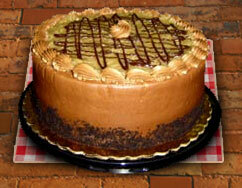 Topped with Pirouline cookie, this is a truly decadent cake! Single Layer Serves 8 $6.99 Your choice of white or chocolate cake iced with vanilla or chocolate buttercream and decorated to reflect the season! 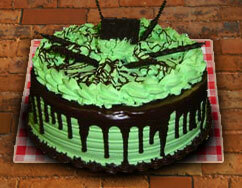 From Christmas to Halloween, we have just the right cake for your holiday party! 1/4 Sheet Serves 24 $16.99 Your choice of white, chocolate or marble cake iced with your choice of icing, and decorated for the season! 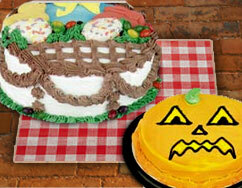 From Christmas to Halloween, we have the perfect cake for your holiday party! 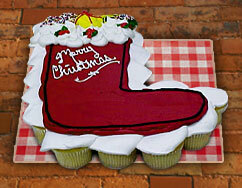 24 CT Serves 24 $16.99 Your choice of white or chocolate cupcakes shaped to fit your party theme! 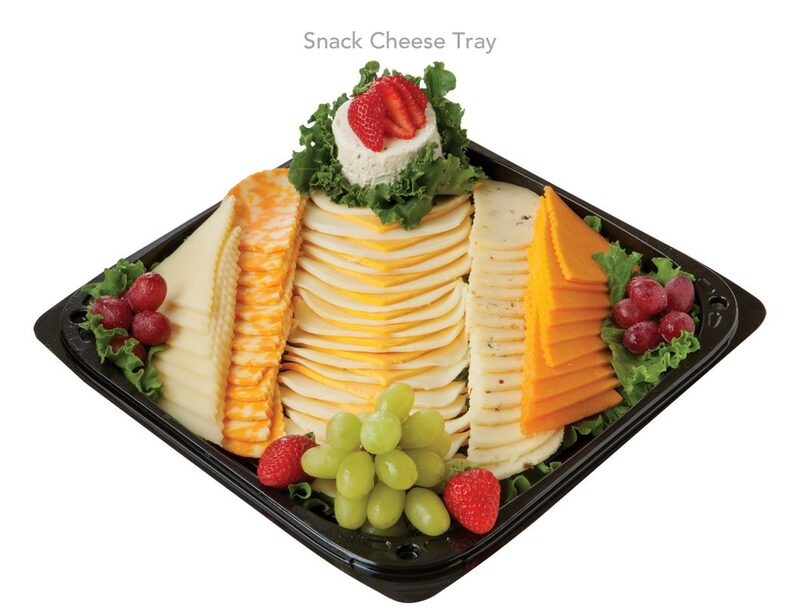 Ask our decorators about a custom design, or choose from an array of existing designs for a tray your partygoers won`t forget! 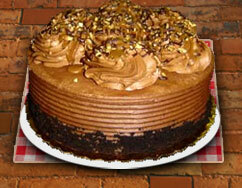 1/4 Sheet Serves 24 $16.99 A decadent fudge brownie iced in your choice of icing and custom decorated to your liking! 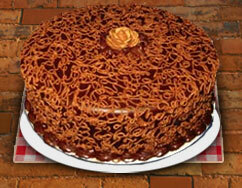 A rich alternative to the traditional birthday cake!